Thailand has no shortage of nightlife. Even in a time of mourning, the bars and clubs in Bangkok and Phuket are still packed every night. But if you’re not in the mood for a ping show or watching a local band cover Maroon 5 songs, then head over to the Chiang Mai Cabaret for a good time. What’s up with Thailand and drag shows? 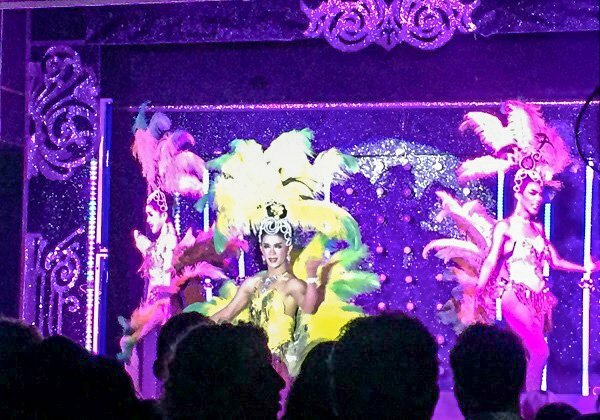 You may be wondering why drag shows are such a big deal in Thailand. It’s hard to look up anything related to Thai tourism without running into information about ladyboy shows. For that matter, what’s a ladyboy? And isn’t that a little derogatory? When I first heard the term, I myself thought it was a slur. But ladyboy is the literal translation of the Thai word Kathoey which is a transgender woman or transvestite. So in Asia, the term is widely accepted; you’ll hear it all the time not in an offensive way. That being said, if you hear a neo-Nazi yelling it out of his truck in Georgia, it’s probably not a friendly greeting. (You’ll know he’s a neo-Nazi if he has a Trump-Pence bumper sticker.) As a general rule, it’s not what you say, it’s how you say it. Thailand, in particular, has a fairly large population of gay and trans people because it’s more tolerant and accepting than surrounding countries. This is yet another reason to love Thailand. And many of the ladyboys in the country make a living by performing and generally looking better than everyone for miles. 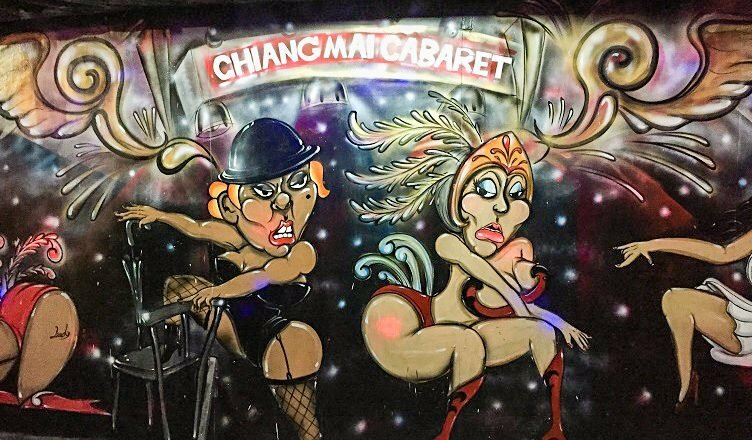 While there are drag shows all over Thailand, the Chiang Mai Cabaret is a great one because it’s really affordable and in a central location. By contrast, the free nightly shows in Patong Beach are a hot mess that I wish I hadn’t been subjected to. And Phuket’s Simon Cabaret, one of the largest in the country costs almost three times as much. The Chiang Mai Cabaret is located just outside the Anusarn Night Market, which is nice because you can arrive early to the show and do some shopping or eat some sticky rice and mango while you wait. Before the show, which is at 9:30 pm every night, the performers hang out in the market trying to get people to come to their performance. You can take pictures for a small tip or watch them give you a preview of the evening’s show. Though the preview doesn’t hold a candle to the actual show. If you buy your ticket early, you can secure a good spot when the show starts. The tickets are 290 baht, which is about $8 and includes a drink and snack. The snack is a bag of nuts. Bring plenty of cash if you plan to keep drinking and to tip the servers and performers. Trust me, after the show you’re going to want a picture of some of these ladies to keep in your locker and swoon over between classes. Before the show started, the MC asked everyone to stand out of respect for the King. One of the girls held up a photo while a somber song played in remembrance. I liked that even though the show is supposed to be fun and raunchy, they still had a moment of silence for the King. Since such a big part of drag shows is the humor, I was a little concerned that the Cabaret would be disappointing because of the language barrier. Through the first couple of songs, there was very little interaction with the audience. But eventually, they started doing the rounds and talking to people in the crowd. There was quite a bit of interaction throughout. And if you’re an attractive man, you’re probably going to get a lot of attention. But you’ll be in good company. There were a ton of men in the audience from all over the world, and they were great sports during the show, playing dress-up and getting a tongue lashing from some of the performers. Without giving too much away, the show included a variety of music and acts, including the ones you’d expect like the man/woman duet and the always moving act where the performer removes the drag makeup. The songs were classic and contemporary, and included show tunes and pop hits. The costumes were flashy and fun, and definitely nicer than you would expect given the price of the show. My favorite act was one girl’s flawless impersonation of Rihanna. Rihanna wishes she looked that hot, to be honest. Outside of a massage, this is one of the best things you can do for less than $10 in Thailand. YAY! I’ve been waiting for this post.